Improves intestinal problems (constipation, bloating). Used for detoxifying the colon. This may not be a traditional adage but it is nevertheless good advice. Modern diets and processed foods block the digestive tract with waste material it was not designed to deal with. 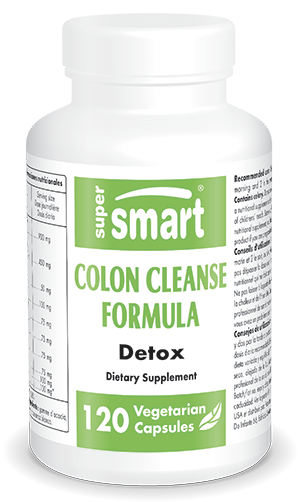 While Colon Cleanse Formula is not a complete colon cleanse, such as the colonic detoxes offered by trained therapists that eliminate mucus and polyp elements, it is formulated to achieve a gentle yet thorough sweep' of the colon system, using simple but carefully-selected plant substances that eliminate residues, parasites and bacteria, and repopulate and reactivate healthy intestinal flora. Pre- or pro-biotics can be added if required, to help maintain healthy intestinal mucosa. - Psyllium powder : a natural source of non-soluble fibre that ensures regular intestinal movements and which has been used for centuries as a colon cleanser (it increases bolus volume). It also has cholesterol-reducing and cardiovascular-protective effects. - Aloe leaf extract standardised in aloïne, which is responsible for its laxative properties, and which can also be consumed in juice form. Its cleansing and regenerating benefits have been recognized for many years. - Senna leaf extract, a classic remedy for an underactive gut in older people, but also good for new mothers post-delivery; very well-tolerated, it can be taken long-term. - Alder buckthorn root, mild plant laxative, more easily tolerated than cascara or rhubarb, which combines well with aloe and senna, boosting their activity. - Celery seed extract, well-known for its purifying, liver- and kidney-protective properties, as well as dandelion leaf extract, a liver-specific cleanser and purifier which improves all biliary markers (bilirubin and transaminases). - L-glutamine : protects gastric-intestinal mucosa (insulin resistance). It restores integrity, plasticity and cleanliness to the whole intestinal wall. - Magnesium, in its hydroxide form, does not cause negative reactions in the kidneys, as can be the case with excessive use of magnesium chloride. Magnesium hydroxide reacts with gastric hydrochloric acid to produce new magnesium chloride, naturally increasing intestinal peristaltism. ...with some periods of non-use to avoid dependency - either selectively, to cleanse the body of residues blocking the cell wall after too many heavy meals perhaps, or simply to feel lighter and cleansed. It should be taken with plenty of liquid, preferably water, and in combination with pre- and pro-biotics to maintain a healthy, infection-free, intestinal wall. For optimal detoxification of the digestive tract, other dietary supplements may also be of interest. To support your detox treatment, you could, for example, take the supplement Rehab, a concentrate of nutrients for stimulating the body’s detox mechanisms. The product Cruciferous Detox Formula, formulated from various extracts of cruciferous vegetables, can help cleanse the liver, a key organ for detoxifying the digestive tract. Finally, the formulation Lectin Flush can help eliminate lectins, proteins known to play a role in some cases of food sensitivity or hypersensitivity. Adults. Take four capsules a day, either two in the morning and two in the evening, or four in the evening.